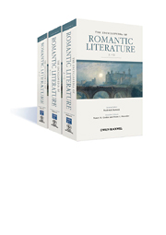 The Encyclopedia of Romantic Literature is an authoritative reference work that covers British artistic, literary, and intellectual movements between 1780 and 1830, within the context of European, transatlantic and colonial historical and cultural interaction. Written by an international cast of leading and emerging scholars. Entries explore genre development in prose, poetry, and drama of the Romantic period, key authors and their works, and key themes.